1. Apply a good amount of cocoa butter or shea butter onto your dark lips and massage them thoroughly twice a day. It will keep them soft and moisturized by preventing cracking and darkening. 2. Never ever lick your dry lips to hydrate them. Rather, keep a tub of petroleum jelly or lip balm handy. Apply it whenever you feel that your lips are getting dry. 3. Rub a thin slice of beetroot on your lips or apply some beetroot juice with a small cotton swab. The natural red color of the ingredient will turn your dark lips pinker gradually. 4. Juice up a few red grapes and apply it on your lips daily to get rid of pigmentation. 5. Massage your black lips with olive oil every night. It will make them soft, smooth and pink slowly. 6. 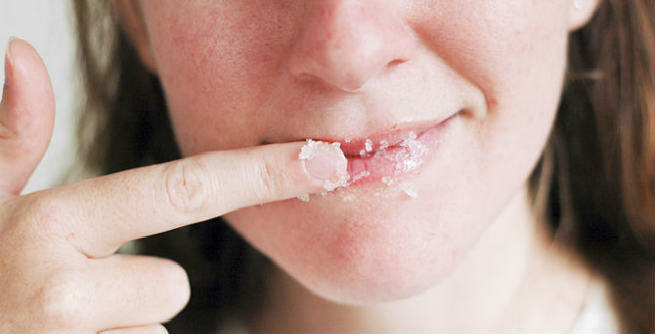 Exfoliate your lips with a mixture of butter and ground sugar. It removes dead skin cells and reveals fresh pink lips. 7. Application of lemon juice is extremely effective in lightening dark lips. Being acidic in nature, it works as a natural bleaching agent and hence, you get visibly pink lips within one month. 8. Lather your lips with a mix of pure coconut oil and fresh lemon juice every day to lighten its dark shade. A slight massage will also do. 9. Prepare a rich blend by grinding some almonds (soaked overnight) and adding fresh milk cream to it. Massaging your lips with it can be very helpful in making them rosy pink. 10. You can get your very own lip tonic by mixing fresh lemon juice and cucumber juice with some coconut water. Regular use of this can make lips soft and pink naturally. 11. Ghee or clarified butter can also help your dark lips turn into rosy pink. Just add a pinch of saffron to some melted ghee and apply on them. 12. Take some fresh rose petals and makes a paste of it with water. Add a little butter to it. Now, massage your lips with the mixture. It will help you restore their natural pink shade. 13. Another natural remedy for dark or black lips is the combination of egg white and fresh ginger juice. Applying it thrice every week can give you soft pink pout easily. 14. Massage your lips with almond oil every day before going to bed. It is a great cure for dark lips and gives significantly fast result. 15. Scoop out the gel from a fresh aloe vera leaf and massage your lips gently with it twice a day. Your lip color will change to a great extent. 16. Use a lip mask made of pure raw honey and fuller’s earth. Apply it on your lips and wait for 15 minutes. Then, wash off with plain water. It will make your lips softer, smoother and pinker. 17. Crush a strawberry and massage your lips with it to get a visibly pink pout. 18. Prepare a paste by mixing gram flower, turmeric powder and a little water. It can be used as a mask twice every week to lighten the black color of lips.